relevant to you and your particular needs. The list is, by no means, complete. consultation to ensure that our current policy doesn't differ from the answer given here. In all probability, it won't. I’d like to set up a time for a consultation; when can we meet? assist you, we'll likely direct you to a qualified and experienced professional who can. us to schedule a time to meet. Can I call you from a "blocked line" – will you answer calls marked "private"? either "blocked", "withheld" or "private". call to a number unless specifically authorized to do so by the caller. If your number is blocked, you can temporarily unblock it by pressing *82 before dialing our number. Still - Do I have to tell you who I am when I call? you for your first name. Do I have to give you any specific information regarding the case when I first call you? Is this legal – can I get in any trouble for hiring you? If we don’t believe that it’s legal, we won’t take the case. expose you to civil liability or criminal charges. Be confident in who you hire. verify this through the Minnesota Board of Private Detective and Protective Agent Services. required to solicit investigative services here. our "Testimonials" page to see how others have felt about using our services. state. You might also consider checking with the Better Business Bureau for a history of complaints. Do you require that I have an attorney before accepting the case? I have an attorney; will you work with him on my case? us. Without doing so, we will not acknowledge having a client by your name. If your findings are helpful to my case, are you willing to testify in court? Yes. We have been called upon to testify on many occasions. Do I get a report, or something, telling me what happened – how do I know what occurred? (usually much sooner) of the completion of the case. happened – can’t I find out sooner? having already spoken to them about the findings. the client. We rely on a combination of both video and digital still photography when conducting surveillance work. As of the time of this writing, our video is recorded primarily in digital format. format, or are incorporated into the final written report, or both. investigation enter an establishment and there’s a need to document the activity therein. activity for the sake of their report, but be unable to document it. Do I get a copy of the videotape when you’re done? such as Windows Media Player, Power DVD, etc. better job of getting videotape for me? investigative services where neither the client nor the subject is associated with Minnesota in some capacity. extensive experience. We do not employ, or train, unlicensed personnel to work your case. his or her pension income. What else should I consider when comparing private detective agencies? What’s your schedule looking like – when can you work this? forward with assigning the case. are begun, but not finished, within 24 hours of accepting the assignment. These are general guidelines only. If I hire you to do surveillance – do you just work it when you want, or do I have some say in it? 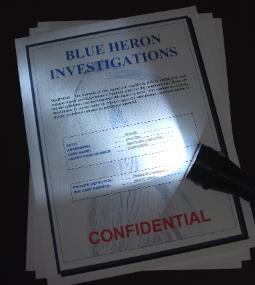 Blue Heron Investigations does not employ unlicensed investigators learning the trade. What is your minimum retainer? $75.00 or $7,500.00. The smallest retainer we've ever accepted was for less than $50.00. projected costs, not retainers, when comparing agencies. to have a high probability of success. What if I hire you, but you don’t find anything – Do I still have to pay? a detective agency, then we may not be the agency that’s suitable for you. ourselves to their lack of standards & ethics. How do you charge? Is it by the hour plus expenses, or is it a flat fee? preferred billing method however, we will only bill by that method. well as the amount of services performed. A retainer is simply “prepayment” for services. time of consultation. That estimated amount becomes the amount of your initial retainer. me how. Will you be able to show me where my money went on an invoice? how your money is spent. It will also show when a refund to you is due. What if you “solve the case” before reaching the amount of the retainer I provided? commit to doing so in writing. What if I give you a retainer, but then change my mind about going forward with the case? day of services. The remainder of your retainer will be returned. return of your retainer. Ask questions. time, and trust that you're going to do the job? detective outside of the narrow group of professionals that we’ve come to trust in the area. Heron Investigations' "Code of Ethics." money from clients to do work that was never performed. We will not provide names. basis where I pay you once I get paid? No; we do not accept cases on a contingency basis. services. In short - we'll find a way to make things work for you. take place at a location that’s both comfortable and convenient to you. somebody – do we have to meet? hone. Even many clients with larger cases prefer not to meet. the country from your company; can I assume that we can take care of this by phone? Absolutely; we do so all the time. Give us a call, and we'll make it work. Do you provide nationwide background checks? that this guy had been convicted of various offenses; how did this happen? misdemeanor, and a few types of misdemeanor convictions. Other convictions will not be on file at that repository. repository. Then too, there are those who plead down their case to a lesser crime. We often find convictions (as well as non-conviction data) that others don't, by conducting a more thorough search. record of it at the state. We found these "alleged" crimes by taking the "next step" in the background check. maintain our client’s confidentiality, we’ll simply refuse the case on other grounds. can you find me a current address? Enter the defendant’s last known address when filing, and then provide us with the court documents to be served. at all; what do you charge? that has resulted in the murder of others. most people are – won’t you get caught doing surveillance? we may need to use two investigators. surveillances” on all of their surveillance cases? It’s more profitable to bill for two investigators than just one. The day goes by faster when you work with another investigator, as opposed to being out there by yourself. It’s less stressful or dangerous when you have a partner a block away. The investigator requiring assistance is not confident in his or her own abilities. (approximately 95 - 98%) does not require two investigators or vehicles. are limited exceptions to the law, primarily in employment situations, which are best left discussed with your attorney. document the infidelity. How much would that cost? of the recording device. If your spouse is having an affair, we can help you in other ways. to learn more about our hidden camera installation services for our Minnesota clientele. “Bobby” can carry it into the other parent’s house? call us to conduct an appropriate surveillance and investigation that will hold up in court – not land you in jail. We're available to work assignments 24 hours a day, but are unlikely to accept your call in the middle of the night. their web site to read about the investigator’s findings. Do you offer this service? also allows them to avoid having to call a client with bad news. password protected “client login” section of a private detective’s web site to read your most personal of information? aside – we prefer to speak with our clients, as opposed to telling them to go read about their case online. I interviewed one of those out of state agencies that say they have investigators everywhere. Well, it sounded good didn’t it? to pay to the Minnesota agency. a Minnesota company to do the job anyway?! our control"; doesn't that mean that they're a firm with employees / detectives here? as a “liason between the customer and the detective.” Do you? 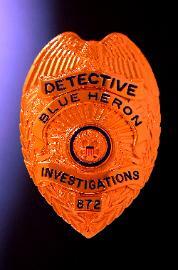 detective actually working your case – then Blue Heron Investigations isn’t the company to handle your case needs. many cases per day. What do you say to that? We’re speechless – that they would actually market this to you. number with them doesn’t it? proclaiming to have agents everywhere? subcontract to licensed investigators here. fly to California or New York to file a claim against a "Worldwide" agency in small claims court? interfering layers of management between yourself and the person doing the work. Investigations is not for you? can go into a bar and flirt with him to see if he asks her out? suspect that your husband is currently involved in an affair, and we’ll be happy to assist. My brother’s wife’s sister’s boyfriend has a problem with…..
consult with you regarding your brother's wife’s sister’s boyfriend. Of course, he’s welcome to call us anytime. involved in a child custody suit. Have your employer call us. Tell him that we understand, and that we'll look forward to his call. hired or work as a licensed PI? even a few months, we've found that we simply don't have the time to answer these questions for everyone who calls. page; you'll find a link to an e-booklet we've written for people like yourself.